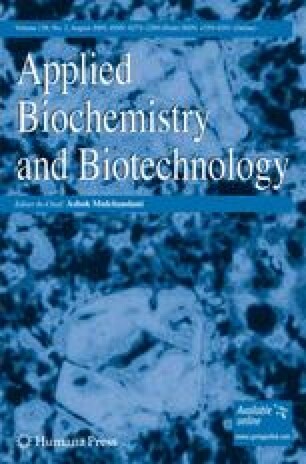 Biosorption of three divalent metals, viz., lead, copper, and cadmium in ternary aqueous mixtures was studied using Phanerochaete chrysosporium in batch shake flasks. The mixtures were prepared containing the metals at their either varying optimum or equal initial concentration combinations in aqueous solution of pH optimum to each of the metals. Following were the optimum initial concentration ranges of the metals in mixture: lead, 60–100 mg/L; copper, 20–60 mg/L; and cadmium, 5–15 mg/L. And, for varying these optimum concentration levels of the metals, a 23 full factorial design of experiments was employed. The results revealed that an increase in lead and cadmium concentrations helped in their better biosorption by the fungus, but an increase in initial copper concentration slightly diminished its removal. Statistical analysis of the results in the form of analysis of variance and Student t test gave a clear interpretation on the roles of both the individual metals and their interactions in the uptake of metals from mixture. Compared to the uptake of metals when presented individually, lead biosorption in mixture was found to be enhanced to a degree as high as 99%; on the other hand, copper and cadmium removals from mixtures were inhibited to the extent of 100% and 98%, respectively. However, this extent of inhibition or enhancement in the metal removals compared to the individual removals was less in mixtures containing all equal concentrations of the metals.